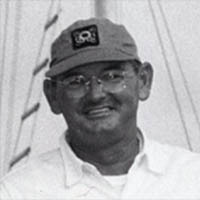 Captain Water Voss was a well-known and respected captain in South Florida from the 1940s to the 1970s and is credited with being one of the first to take a sport fishing boat from the U.S. to Bermuda. An innovator, Voss designed the Dream Girl-- one of sport fishing’s most emulated fishing boat designs and one of the most dominant boats in the very competitive world of tuna fishing in the 1950s and 1960s. Aboard the Dream Girl skippered by Voss, IGFA Past President E.K. Harry enjoyed legendary tuna exploits.